Input fills the gap and provides desktop-inspired input controls for mobile apps. 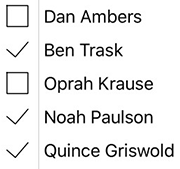 Combine critical text editing with the efficient power of drop-down selection in one with AutoComplete and ComboBox. 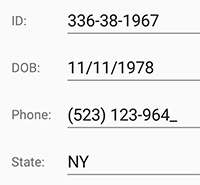 Provide smarter input for phone numbers and postal codes with Masked Text. 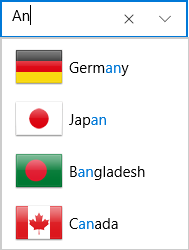 Create your own custom drop-down with ease using DropDown. Give the power of search and selection to the user with a cross-platform AutoComplete control. View completion suggestions in a drop-down list while while the user types in the editable text view. Make it your own with custom delay, drop-down formatting, and text match highlighting. Provide a filtered data source dynamically for larger data sets. Fill the native gap with a simple toggle button that supports an on or off state. Customize the style to your brand, or add an image to represent on and off. CheckBox provides a cross-platform implementation of the classic checkbox control and fills the gap in iOS and Xamarin.Forms. Visualize and provide input for Boolean values. Allow users to select and clear the control by tapping. With ComboBox you can display a list of items in a drop-down, or create your own custom editor with DropDown for Xamarin. Allow the user to edit the text in ComboBox. 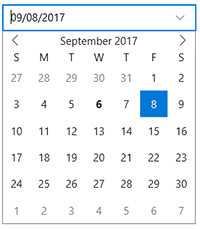 Put any view inside the DropDown's drop-down part of the control. 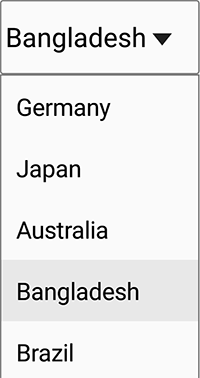 Drop-downs are mobile-friendly and display in the optimal direction to avoid going off-screen. 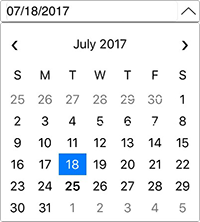 By combining a ComboBox, Masked Input, and Calendar control, you can create a custom date picker for your native mobile apps. You can use a combination of controls to create multiple custom drop-down lists. With the Masked Input controls, you can provide instant, code-free formatting on user input using the Mask property. Choose whether or not to show prompt characters and literals by simply setting one property. The prompt character indicates to the user that text can be entered (such as _ or *).